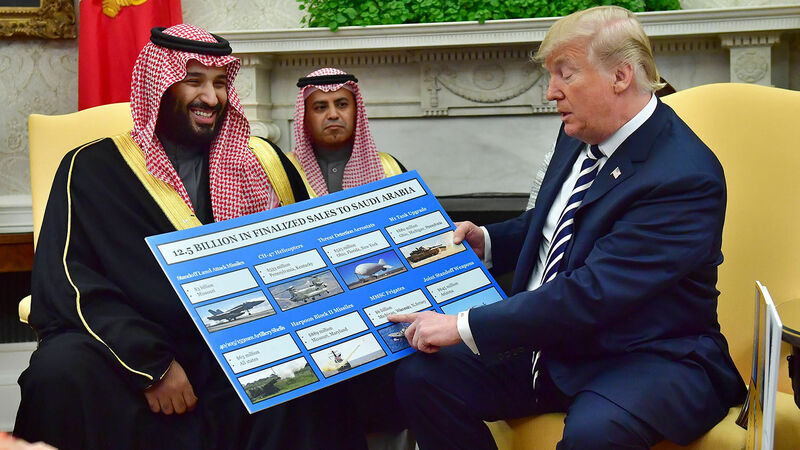 President Donald Trump holds up a chart of military hardware sales as he meets with Saudi Arabian Crown Prince Mohammed bin Salman in the Oval Office on March 20, 2018, in Washington, D.C.
Is recent Iraqi history repeating itself in Yemen? In 2015, United States Oshkosh m-atv armored vehicles were paraded through the streets of the Yemeni city of Taiz—not by Americans, but by terrorists. The Yemeni civil war began in 2014 with Houthi rebels gaining control of Yemen’s capital city, Sanaa. Unhappy with the proposal to split the country into six federal regions, they forced Yemeni President Abdrabbuh Mansur Hadi and his cabinet to resign, dissolved parliament, and established the Revolutionary Committee. President Hadi and his ministers managed to slip out of Sanaa and relocate their government to Aden. In 2015, the Saudi government formed a military coalition with Bahrain, Egypt, Kuwait, Qatar, Sudan, the U.A.E. and the U.S. to support Hadi’s internationally recognized government in its battle against the Houthis. The cnn report comes at a time of high tension between Saudi Arabia and the U.S. New satellite images have revealed a Saudi facility reportedly used to develop and test ballistic missiles. Many in Congress are outraged over last year’s murder of journalist Jamal Khashoggi, allegedly carried out by the Saudi government at its embassy in Istanbul. The U.S. is beginning to question whether Saudi Arabia is responsible enough to possess such advanced and superior military equipment. The American-made vehicles were sold to Abu Dhabi in 2014 and incorporated into its military. But when the civil war began and the coalition formed in 2015, the U.A.E. transferred these vehicles to Yemeni factions in return for their loyalty against the Houthi rebels. The U.A.E. sold some of its U.S.-made vehicles to the Abu al-Abbas Brigade. The militia’s founder, Abu al-Abbas, was sanctioned by the U.S. for his alleged support of al Qaeda and the Islamic State. Throughout the conflict, antitank missiles, artillery, armored vehicles, guns and heat-seeking lasers—a large portion of which is American-made, top-of-the-line military equipment—flooded into the war-torn nation. In September 2017, a Houthi-run tv channel broadcast images of rebel leader Mohammed Ali al-Houthi sitting in a captured American-made mrap armored vehicle in the capital Sanaa as a crowd chanted “Death to America.” Now that Iran’s Houthi proxy has captured this equipment, it can work to exploit its vulnerabilities and reverse-engineer it for domestic production. A similar situation occurred in Iraq. According to the Military Times, last February, “Nine Abrams tanks fell into the hands of Iranian-backed militias during anti-Islamic State fight.” The tanks were originally given to the Iraqi government but ended up in the hands of Iranian-backed militias. The U.S. Department of Defense acknowledged the loss of military equipment to the Popular Mobilization Units (pmu), an Iraqi, state-sponsored, majority-Shiite, umbrella organization composed of about 40 militia groups. These militias are also heavily supported by Iran. When these nine Abrams tanks were captured by the pmu, they were, in essence, captured by Iran. The pmu used the tanks in the front lines of an attack against the U.S.-backed Kurds in northern Iraq to gain control of the Kirkuk oil fields. Afterward, the tanks were returned to the Iraqi Security Forces. America may have helped drive the Islamic State out of Iraq and Syria—but now America is about to be driven out of Iraq and Syria by Iran! We are about to see a vicious turnaround. In many ways, it has already started. This revelation, in addition to the alleged Saudi murder of Jamal Khashoggi, could push the U.S. to withdraw its support from the Saudi-led coalition in Yemen. This would be a substantial win for Iran. cnn Newsroom posted a video on social media saying it is “infuriating but not surprising” that American weapons fell into the hands of the enemy. The news panel also mentioned their support for an American withdrawal from the Yemeni civil war. Unilaterally cutting off all U.S. support would inevitably bolster the war effort of the Houthis and their Iranian sponsors. It would encourage their belief that the coalition is fracturing and that if they only hold out long enough, the Houthis might still win an outright military victory. For more than two decades the Trumpet has watched the decline of the United States as a global military power and has frequently stated that America has won its last war. Herbert W. Armstrong, unofficial ambassador for world peace and editor in chief of the Plain Truth newsmagazine, which had a circulation of over 8 million, made that forecast based on specific prophecies in the Bible. Mr. Flurry continues the same forecast. In Leviticus 26:19, God said He would “break the pride of your power.” A break occurs suddenly. The U.S. has not won a war since World War ii, when the pride of its power was broken. In verse 20, God says that America’s “strength shall be spent in vain.” America contributes its troops and military equipment to various engagements, but they are spent in vain as, after decades of investment, it withdraws troops before outright victory. Here God identifies the great peoples of the Earth who are the most wealthy and beneficent, the most powerful—yet at the very time their power reaches its zenith, He suddenly “breaks” the pride of their power. God said He would “cut off thy horses [tanks, m-atvs, mraps] out of the midst of thee, and I will destroy thy chariots” (Micah 5:10). America’s advanced military technology is only advanced if its enemies do not have the same or comparable technology. Now that American-made equipment is in the hands of its enemies, America’s strength differential is weakening.